^ Compare: March, G. Patrick (1996). "3: Ivan IV and the Muscovite Drang nach Osten". Eastern Destiny: Russia in Asia and the North Pacific. Westport, Connecticut: Praeger Publishers. p. 26. ISBN 9780275956486. Retrieved 8 February 2017. 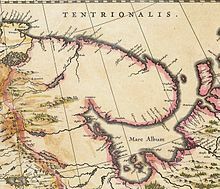 It was in pursuit of a northeast passage that the English under the leadership of Richard Chancellor arrived in Kholmogory in 1553. Lake Onega is a lake in the north-west European part of Russia, located on the territory of Republic of Karelia, Leningrad Oblast and Vologda Oblast. 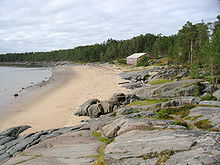 It belongs to the basin of the Baltic Sea, Atlantic Ocean, and is the second largest lake in Europe after Lake Ladoga. The lake is fed by about 50 rivers and is drained by the Svir River. The Mezen is a river in Udorsky District of the Komi Republic and in Leshukonsky and Mezensky Districts of Arkhangelsk Oblast in Russia. Its mouth is located in the Mezen Bay of the White Sea. Mezen is one of the biggest rivers of European Russia. It is 857 kilometres (533 mi) long, and the area of its basin 78,000 square kilometres (30,000 sq mi). The principal tributaries of the Mezen are the Bolshaya Loptyuga River (left), the Pyssa River (left), the Mezenskaya Pizhma River (right), the Sula River (right), the Kyma River (right), the Vashka River (left), the Kimzha River (left), and the Pyoza River (right). The Onega is a river in Kargopolsky, Plesetsky, and Onezhsky Districts of Arkhangelsk Oblast in Russia. The Onega connects Lake Lacha with the Onega Bay in the White Sea southwest of Arkhangelsk, flowing in the northern direction. The discharge at the source is 74.1 cubic metres per second (2,620 cu ft/s) and at the mouth is 505 cubic metres per second (17,800 cu ft/s). The river is 416 kilometres (258 mi) long, and the area of its basin 56,900 square kilometres (22,000 sq mi). Its main tributaries are the Voloshka (right), the Kena (left), the Mosha (right), the Kodina (right), and the Kozha (left). The major tributary of the Lake Lacha is the Svid. The Onega Bay is located in the Republic of Karelia and Arkhangelsk Oblast in Northwestern Russia, west of the city of Arkhangelsk. It is the southernmost of four large bays and gulfs of the White Sea, the others being the Dvina Bay, the Mezen Bay, and the Kandalaksha Gulf. The area of the bay is 6,630 square kilometres (2,560 sq mi). 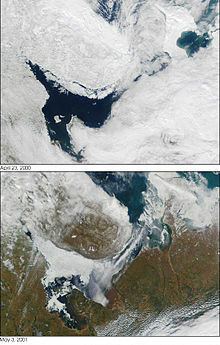 The Onega Bay is 185 kilometres (115 mi) long and 50 kilometres (31 mi)-100 kilometres (62 mi) wide. The average depth of the bay is 16 metres (52 ft), and the maximum depth is 36 metres (118 ft). The bay freezes in winter. The Dvina Bay is located in Arkhangelsk Oblast in Northwestern Russia. It is one of four large bays and gulfs of the White Sea, the others being the Mezen Bay, the Onega Bay, and the Kandalaksha Gulf. The two main river emptying into the Dvina Bay is the Northern Dvina River, while the two cities on the bay are Arkhangelsk and Severodvinsk. The Dvina Bay is 93 kilometres (58 mi) long and 130 kilometres (81 mi) wide. Administratively, the coast and the islands belong to Primorsky District of Arkhangelsk Oblast. 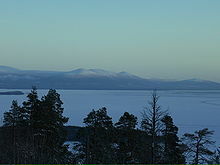 The Kandalaksha Gulf, Finnish: Kantalahti) is located in the Republic of Karelia, and Murmansk Oblast in northwestern Russia. Forming the north-western corner of the White Sea, it is one of four large bays and gulfs of this sea, the others being the Onega Bay (south-west), the Dvina Bay (south), and the Mezen Bay. 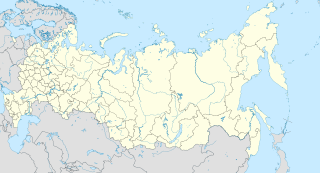 Malye Korely is a village in Primorsky District of Arkhangelsk Oblast, in the north of Russia. The main sight of the village is an open-air museum, featuring the traditional wooden architecture of Arkhangelsk area. The museum is located on the right bank of the Northern Dvina River close to the mouth of the Korelka River, about 25 kilometres (16 mi) southeast from the city of Arkhangelsk. Port of Arkhangelsk is a major seaport at Arkhangelsk, located at the mouth of the Northern Dvina River, 50 km from the Dvina Bay of the White Sea. The important point links with coastal areas of the Russian North. For much of Russia's history this was Russia's main centre of international maritime trade, conducted by the so-called Pomors from Kholmogory. The White Sea Rift System is a complex of rifts manifested as numerous individual grabens located chiefly in the White Sea but including onshore areas and a strip of the Barents Sea. The rifts run in a subparallel manner from northwest to southeast where the rift system continues under the East European Platform. The system or complex originated due to extensional tectonics acting during the Middle to Late Riphean in the Proterozoic. This tectonic environment is believed to have been related to the break-up of the ancient supercontinent Palaeopangea. During the Riphean the graben structures were filled by Jotnian sediments. During the Middle Paleozoic the rift system was reactivated resulting in intrusion of alkaline magmas. In the Late Cenozoic the rift system was reactivated again resulting in the formation of the modern White Sea. Brín-Navolok is a town in northern Russia, located in the Arkhangelsk region. It is the namesake of the Brin-Navolok municipality, as well as its administrative and geographical centre.